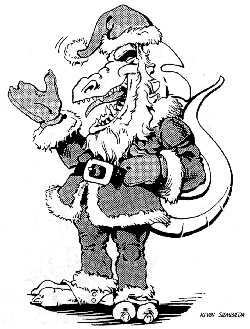 Happy holidays to everyone! Christmas is nearly upon us and Kwanzaa is Wednesday. We send all of you who celebrate these holidays the warmest wishes and hope your celebration is joyful and filled with love. I have been delighted to see so many gamers from outside the USA taking advantage of the Christmas Surprise Package offer. As I have noted, it is a great way to mitigate the shipping cost. I mean, if you are getting roughly $100 worth of product for $46, the high cost of shipping (typically $50-$65 outside the USA) is mostly negated. It’s like buying the books at retail plus a little extra for shipping. Can’t speak to VAT or Customs fees, but it’s a big help. We have been seeing a lot of orders from Australia, Canada, England, Finland, France and Germany as well as other European countries. And of course, tons of Surprise Packages for our fellow Americans. Smart, because these Grab Bags are a great deal and a way to get signed books. I’m also pleased to see many new customers joining the ranks of Palladium gamers and a large number of gamers coming back into the fold! Awesome, we welcome you all. Keep those orders coming because the Surprise Package offer will be continued for a few more weeks. Palladium is extending the Christmas Surprise Package offer for a few weeks AFTER Christmas. This extension has become part of the Grab Bag tradition as much as the Surprise Packages themselves. 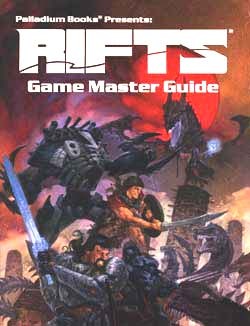 And do not miss the new DriveThruRPG.com Sale of Rifts® PDFs titles including Rifts® Ultimate Edition, Rifts® core books, Rifts® World Books, Rifts® Sourcebooks, Rifts® Adventure Sourcebooks, and the Coalition Wars® Siege on Tolkeen™ Sourcebook series. 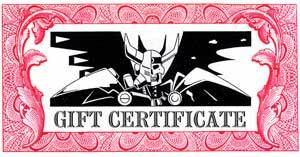 Remember, it’s not too late to send a Rifts® PDF Holiday gift or a Gift Certificate in time for the holidays! More details below. 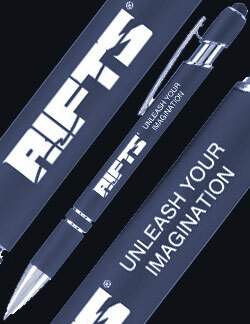 It’s not too late to send a Rifts® PDF Holiday gift in time for the holidays. Or to get that little something for yourself. 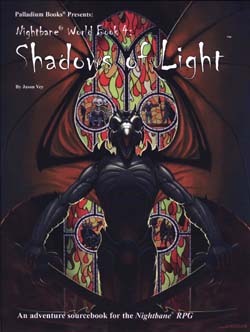 We are celebrating the arrival of Christmas and Kwanzaa by offering different sales of PDF titles on DriveThruRPG.com through Christmas and into the new Year. 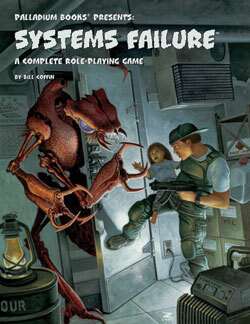 Every few days, one PDF game sale will come to an end and another will start. This sale offers the Rifts® core books, World Books, Sourcebooks, and more! 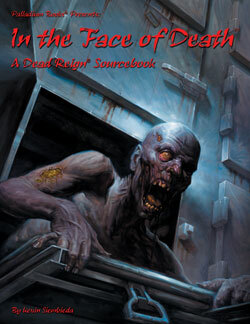 It all takes place on DriveThruRPG.com – enjoy. DriveThru Christmas Sale #4 – Rifts® RPG, World Books AND Sourcebooks – Weekend of December 20-23, 2018. A clue about the next sale: Explore the Megaverse®. In the joyful spirit of Christmas, the rest of this Update is limited to comments from just some of the many fans who leave us brief comments in their Surprise Package orders. We love reading them and seeing people’s favorite books, and appreciate the kinds words, holiday well wishes and constructive suggestions. I read every single Grab Bag order and select the items that go into each one. I try to make each one special and tailored to your wishes and wants. I also like posting some of the comments in these Weekly Updates so you can see what other gamers are saying and playing. It also enables me to give a little shout out to some of you to show our appreciation. Even though we only indicate the person’s initials and the city and state where they live, we hope you know who you are. Of course, we appreciate each and every one of you, and wish you ALL a very Merry Christmas, a Happy Hanukkah, a joyful Kwanzaa and Winter Solstice, and a wondrous New Year that is filled with good health, prosperity and joy. W.B. in Glenalta, South Australia, writes: Thank you for continuing to do this each year. I really appreciate the incredible work you have all done over the years. Merry Christmas and Blessings on you and your families. M.L. in Narvik, Norway, writes: The one stress-free purchase of the season! Thank you and warmth and lights for all! W.S. in Pasadena, Maryland, writes, in part: I love Palladium’s products. I have been playing your RPGs since I was 16 years old! I grew up on your products. All I want to say, and I hope this makes it to Mr. Siembieda, is thank you for all your spectacular, fantastical hard work. My life is better because of the outlet for my creativity that you have provided. Well done to you and everyone who has ever contributed no matter how small to your Megaverse®. [I am humbled by your heartfelt words, W.S. Thank you. I’ve said many times before, we love what we do and love our fans. I could not have asked for a more magical life. Sure we’ve had our troubles and tribulations. Life is hard. But it becomes so much less difficult and so worthwhile when you are writing and designing for people like you and so many Palladium fans. I hope to continue to do so for another 2-3 decades. Keep that imagination burning bright and thank you so much for your kind words. They mean a lot to all of us. T.T. in Oshawa, Ontario, Canada, writes: Favorites: Palladium Fantasy®, Heroes Unlimited™, and Rifts®. My 12 year old son has been gaming Palladium since he was seven years old. He is now spreading his wings and Game Mastering. C.H. in Ellendale, North Dakota, writes: We love all the books! We have moved, but our small group still gets together once a week. Our two daughters are as interested as ever. The six year old is asking to join the table. J.T. in Toronto, Ontario, Canada, writes, in part: After the Bomb® were probably my first [gaming] books. I love Heroes Unlimited™, also Beyond the Supernatural™ is great, with average humans fighting great evil. I just want to thank all of you for going to Anime North and talking to me, even about movies and signing my stuff. It was a pleasure meeting you all. I am an old gamer and I think your system is the best and most creative out there. Thanks again to all the staff and freelancers. Take care all of you. C.C. in Thomasville, North Carolina, writes: Favorites: Palladium Fantasy®, Dead Reign®, Beyond the Supernatural™, Ninjas & Superspies™, Weapon Compendiums™ and The Rifter®. Looking to rebuild my Nightbane® collection. 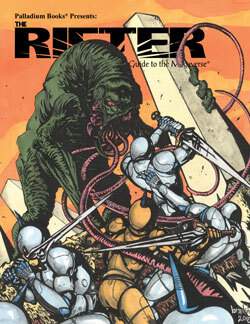 Also wanting to catch up on The Rifter®. N.O. in Mankato, Minnesota, writes: Thank you so much for putting out such amazing material. I have been so happy to be able to get back into games after being away for a few years. I have been lucky to have enough local friends to play with and I have had a lot of fun introducing them to Palladium games! I look forward to opening my Grab Bag from Kevin! B.C. in Ajax, Ontario, Canada, writes: I figured this [the Grab Bag] was the best way to complete my Palladium Fantasy collection. Merry Christmas to all of you and God Bless. R.K. in Hixson, Tennessee, writes: A major thank you and Merry Christmas to you and all your staff. You guys have given me and my friends countless hours of fun fiction and fantasy just by doing what you guys and gals do. So again Merry Christmas and a blessed New Years. P.G. in Melrose Park, Illinois, writes: Thanks again for many years of adventure. W.K. in New York, New York, writes: In the process of replacing some of my well-used books. M.Q. 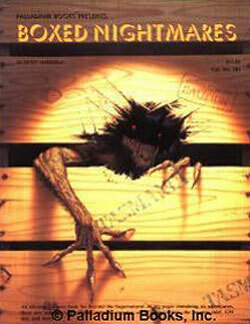 in Fort Knox, Kentucky, writes: I have been playing Rifts® since the very first edition was released. I am glad that I can introduce a brand new generation of up and coming gamers to your games. [Hmmm, funny you should mention a book dedicated to dragons. 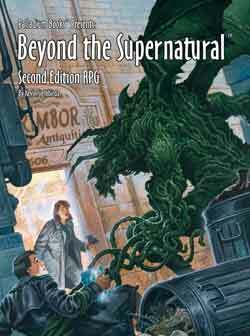 In the meantime, C.O., you might want to check out Dragons and Gods™ for Palladium Fantasy® with Rifts® conversion notes, if you haven’t already. E.V. in Webster Groves, Missouri, writes, in part: Autographs not necessary, but nice ... thank you for still being around after all these years! I even still have my 1st Edition copies of Beyond the Supernatural™, Robotech® and TMNT®, lol. You guys are such a part of my life, I hope for many more years to come. Keep up the amazing work. M.W. in North Grafton, Massachusetts, writes: My gaming group and I loved meeting you all at Gen Con and we hope to see you again next year! 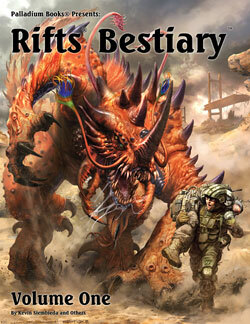 I personally cannot wait for the Rifts® Bestiary. C.H. in Port Perry, Ontario, Canada, writes, in part: My husband has loved Rifts® since he found this community as a teenager ... He has passed on his love of the game, the creativity, and the camaraderie to our two daughters, 10 and 16, as a family game... Thanks. J.W. in Vancouver, Washington, writes: Thank you for once again providing this wonderful opportunity [the Surprise Package offer] during the holidays. I greatly appreciate the chance to complete my After the Bomb® and Heroes Unlimited™ book collection at a fantastic price! Likewise, the ability to check out new areas of the Palladium multiverse that have long intrigued me is just the motivation I needed to take the plunge. Last year was my first time taking advantage of this awesome offer. I was extremely happy with what I received. Best wishes to you all during this festive season and the year to follow. D.T. in San Antonio, Texas, writes: Kevin, you deliver imagination and adventure to us all year. I hope that you and your game making geniuses enjoy the holidays as much as you have entertained us all.